I recently bought an old book on Persian carpets called "Antique Rugs from the Near East" written by Bode/Kuhnel in 1970. On the cover of the book is a carpet that I have seen online before and that has always intrigued me. 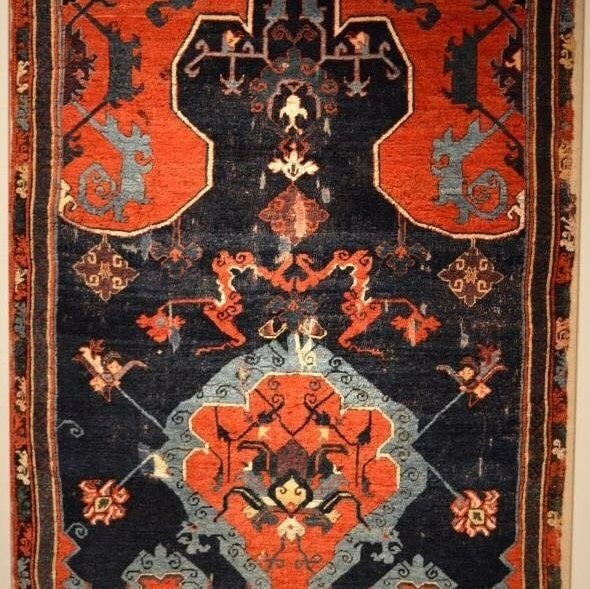 It is a niche cloudband rug from Anatolia and it has the "mother goddess of weaving, the spider", on it. Upon further reading and investigation I found that the rug belonged to Heinrich Von Angeli who purchased it from Wilhelm Von Bode in 1871. Von Bode (10 December 1845 – 1 March 1929) was a German art historian and curator. Born Arnold Wilhelm Bode in Calvörde, he was ennobled in 1913. He was the creator and first curator of the Kaiser Friedrich Museum, now called the Bode Museum in his honor, in 1904. Bode studied law at the Universities of Göttingen and Berlin, but took an interest in art during his university years. While practicing law in Braunschweig he systematically rearranged the ducal art collections, and visited a number of museums and private collections in Belgium, the Netherlands, and Italy. After studies in art history in Berlin and Vienna, he received his doctorate from the University of Leipzig in 1870 based on his dissertation Frans Hals und seine Schule. In 1871 Bode participated in the so-called "Holbein convention" in Dresden, at which a number of prominent art historians convened to determine which of two versions of Hans Holbein the Younger's Meyer Madonna was the original work. In 1872 he took a position as an assistant curator of sculpture in the royal museums in Berlin, and became director of the department in 1883. 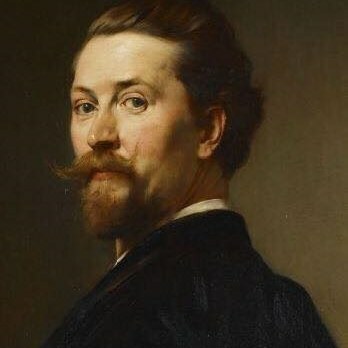 He took over the Gemäldegalerie in 1890, and became general director of what is now the Berlin State Museums in 1905, succeeding Richard Schöne. Many of his efforts were devoted to the new Kaiser Friedrich Museum on Museum Island; his close relationship with the imperial family, his political astuteness, and his relationships with artists and collectors throughout Europe enabled to amass a major collection for the museum. In the 1890s Berlin was far behind Munich and Dresden in its art collections, but with the enthusiastic participation of Wilhelm II, Bode was able to shift the center of the German art world to the capital. He was also in charge of rebuilding the museums of Strasbourg, whose collections had been entirely destroyed in 1870 by Prussian bombardments during the Franco-Prussian War. Bode occupied this post from 1889 to 1914, establishing the Musée des Beaux-Arts and the Cabinet des estampes et des dessins as well as setting the grounds of part of the current Musée de l’Œuvre Notre-Dame's collections. Bode's writings on a wide variety of topics in art history, particularly Italian Renaissance art, were widely influential, and remain key texts in the field. 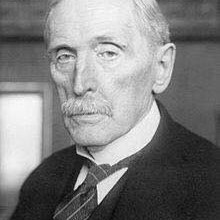 His autobiography, Mein Leben, was published posthumously in 1930. Heinrich von Angeli was born on 8 July 1840 in Sopron (Austrian Empire). He studied at the Vienna Academy in Düsseldorf before practising as a history painter in Munich 1859-62. Returning to Vienna, he became a Professor at the Academy and a fashionable portrait painter. 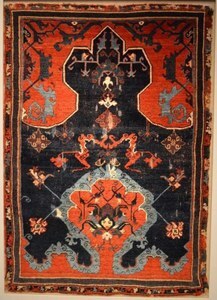 Like many portrait painters of the era, Heinrich too used Oriental rugs in his paintings and this niche cloudband rug from Anatolia was one he used more often. He not only painted the portrait of the Crown Princess of Prussia in 187, 1874, 1877, 1880, 1882 and 1893; but also that of Queen Victoria in 1875, 1890 and 1899. He was also commissioned to paint Empress Elisabeth of Austria in which he also used this particular carpet. Bode bought back the rug from Heinrich's widow in around 1925 (Heinrich died in Vienna on 21 October 1925) and it later ended in the collection of Berlin Kaiser Friedrich Museum and later into Museum fur Islamische Kunst. Elisabeth of Bavaria (24 December 1837 – 10 September 1898) was Empress of Austria and Queen of Hungary, and many other titles through her marriage to Emperor Franz Joseph I. Not only was she a beautiful subject to paint, but her personal story adds just so much more drama to it all. Elisabeth was born into the royal Bavarian house of Wittelsbach. Nicknamed "Sisi", she enjoyed an informal upbringing before marrying Emperor Franz Joseph I at the age of sixteen. The marriage thrust her into the much more formal Habsburg court life, for which she was unprepared and which she found uncongenial. Early in the marriage she was at odds with her mother-in-law, Archduchess Sophie, who took over the rearing of Elisabeth's daughters, one of whom, Sophie, died in infancy. The birth of a male heir, Rudolf, improved her standing at court, but her health suffered under the strain, and she would often visit Hungary for its more relaxed environment. She came to develop a deep kinship with Hungary and helped to bring about the dual monarchy of Austria–Hungary in 1867. 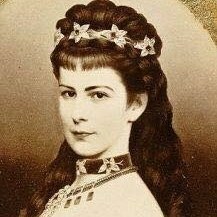 The death of her only son and his mistress Mary Vetsera, in a murder–suicide at his hunting lodge at Mayerling in 1889 was a blow from which Elisabeth never recovered. She withdrew from court duties and traveled widely, unaccompanied by her family. In 1890, she had a palace built on the Greek Island of Corfu that she visited often. Named Achilleion, after Homer's tragic hero Achilles, the palace featured an elaborate Greek mythological motif and served as a refuge. She was obsessively concerned with maintaining her youthful figure and beauty, which were already legendary during her life. While travelling in Geneva in 1898, she was stabbed to death by an Italian anarchist named Luigi Lucheni. Elisabeth was the longest serving Empress of Austria at 44 years. I never managed to find a photo of the painting of Elisabeth on the niche cloudband rug from Anatolia painted by Heinrich, but I cannot help but think just how suitable this rug with the lone goddess spider was to include in her painting.